Gov. 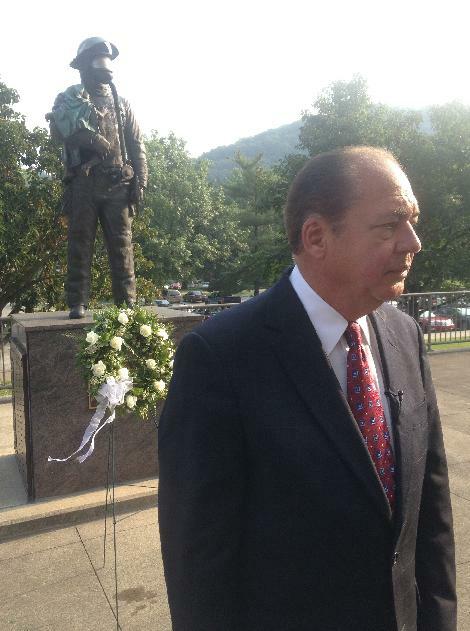 Earl Ray Tomblin presents a wreath at the Fallen Firefighters' Memorial on the State Capitol grounds to mark the anniversary of September 11, 2001. “It was one of those times when we had a quick session. Everyone was very concerned. We had never really experienced anything like this before. Shortly thereafter, I sent the members of the Senate home, our staff home. People were just stunned and didn’t know what was going to happen next,” said Tomblin. Tomblin also met briefly with first responders and officials from the state Department of Homeland Security and Emergency Management at the ceremony, including Frank Kennedy. Now a training officer with the state Department of Homeland Security and Emergency Management, Kennedy responded to the September 11 attacks as a marine patrol officer with the East Hampton, N.Y. Police Department. Having patrolled the perimeter of the World Trade Center for 36 hours until the National Guard could be deployed, Kennedy said it took a while to learn about those he knew who perished in the attack. "It's an exceedingly tough day. It's a day I probably don't watch the news at all," said Kennedy. "I lost six friends that were NYPD officers and five friends that were FDNY officers--people I grew up with and had known my whole life." At the Sept. 11 wreath ceremony Gov. 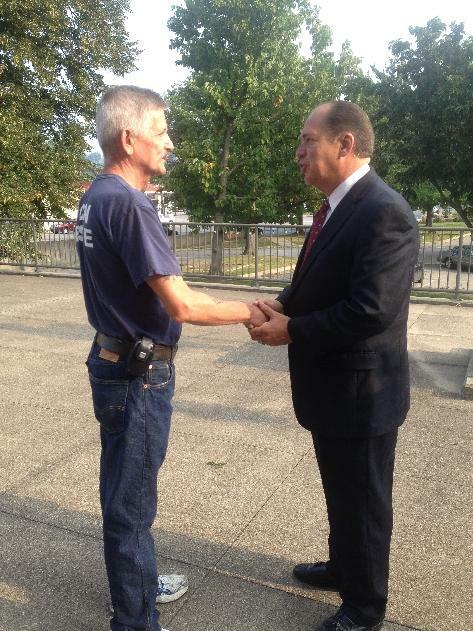 Tomblin shakes hands with Frank Kennedy, Training Officer for the State Department of Homeland Security and Emergency Management. Kennedy was a first responder in with the East Hampton, N.Y. Police Department New York City 12 years ago. Upon retirement, Kennedy moved to West Virginia to be close to his son and decided to go back to work with the Department of Homeland Security, a move he said somewhat helps him cope with the experience of being on the scene in New York City 12 years ago. He said it's also helped him see the importance of the work of first responders. "It's not just New York that was affected. Obviously, D.C. was affected, Pennsylvania and very well West Virginia could have been affected if that plane had flown a little longer," said Kennedy. "I think it is something every American should be concerned about and remember because there was people running in while other people were running out. That's the nature of first responders."